Oat flour makes it good for your gut and gluten-free. I try to bake as often as possible with whatever fruit is at peak freshness—which requires a little more creativity in winter. (The farmers’ market looks way different now than it did a few weeks ago.) Typically, yummy baked treats are made with added sugar, but using fruit instead adds a natural sweetness that’s actually good for you.So what’s actually in season this time of year? Persimmons—that orangey, tomato-like fruit you’ve possibly spied in the grocery store and not known how the heck to use them. Besides being loaded with vitamin A and serving as a natural sweetener, they’re so pretty when sliced laterally or in wedges like apples, adding a sophisticated pop of freshness and color to your cheese plate, cocktail, or salad. 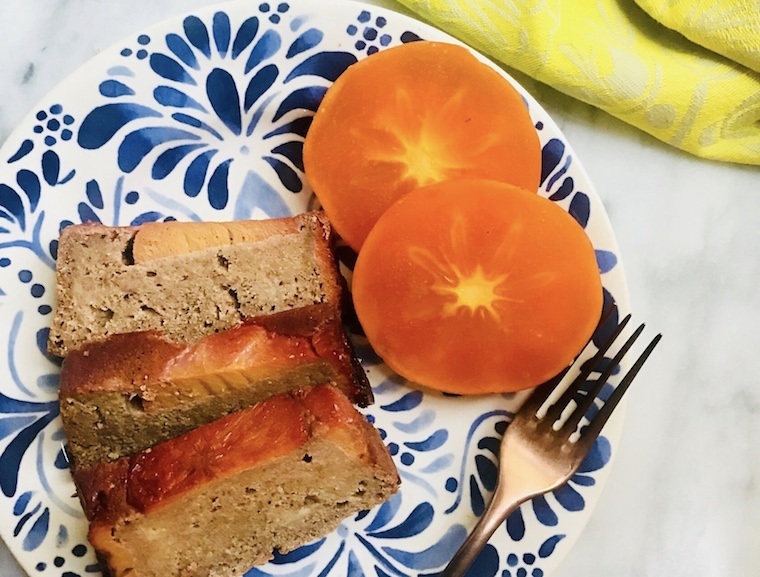 Or you can throw a little persimmon puree into your overnight oats, pancakes, or muffin batter.This take on a classic crowd pleaser, banana bread, is easy to throw together but looks fancy (thanks to that persimmon) and hits so many health notes, it’s kind of ridiculous. By using oat flour I cut out gluten and add a prebiotic soluble fiber. The kind in oats, beta-glucan, is a powerful prebiotic that actually helps feed the beneficial bacteria in your gut, and pulls double-duty by regulating blood sugar. Also in this recipe is Greek yogurt for calcium and tang and bananas, another prebiotic. You can spice your cake however you like, but I like to add cinnamon, which is high in antioxidants and naturally antimicrobial, and cardamom for more cozy, snow-day-season yumminess. The recipe works well baked as muffins rather than bread, too. Just adjust the cook time to 30 minutes. 2. In a small saucepan over medium low heat, add persimmons and maple syrup. Cook until maple syrup is foamy and fragrant, about five minutes. Remove from heat and allow to cool. 3. In a bowl, combine oat flour, baking soda, salt, and spices. Set aside. 4. In the bowl of a stand mixer, cream together butter and cooled persimmon maple syrup for two to three minutes. Add eggs, vanilla, bananas, and yogurt and mix two minutes more. Fold dry ingredients into wet and mix with a spoon until just combined. 5. Grease a loaf pan with butter or coconut oil or use a nonstick loaf pan. Place persimmon rounds on the bottom of the loaf pan. Pour batter over the rounds and transfer pan to oven. Bake 55 minutes or until a knife comes out clean after being inserted into bread. 6. Let cool for five minutes, then invert over a plate and allow to finish cooling before serving.